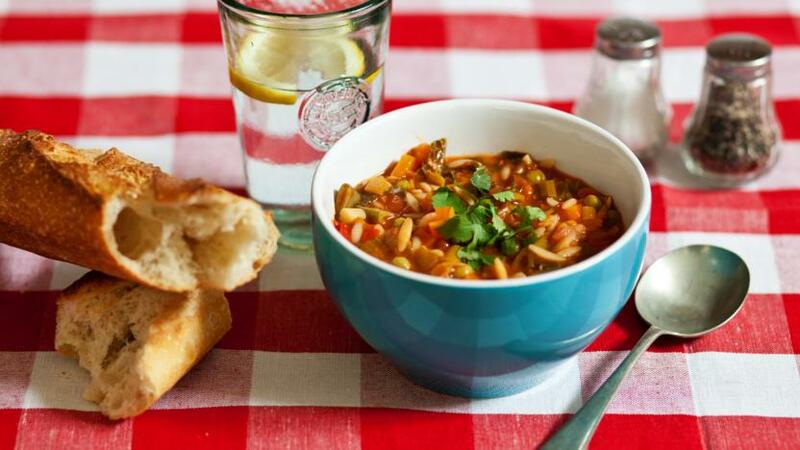 Italian vegetable soups are light and healthy - kids can do most of the preparation and can help with flavouring the soup. It is best for an adult to do the actual cooking at the hob but kids can watch if they can do this from a safe distance on a stable stool or step. Kid’s job: Chop all of the vegetables into tiny pieces, as small as you can (you can leave the peas whole). You can use your fingers, or a salad knife (with an adults help) or use clean child-friendly scissors to chop the herbs, cabbage and spring onions. Adult’s job: Heat a large saucepan and add a teaspoon of olive oil or butter. Gently fry the spring onion or leek for five minutes, stirring often. Adult’s job: Add the garlic, the rest of the vegetables, dried herbs and tomato puree and stir for a minute. Adult’s job: Add the tinned tomatoes and stock and bring to the boil. Adult’s job: Add the pasta and any meat or beans you want to use and cook for 8 more minutes. Kid’s job:Get your grown up to spoon a little of the soup into a small bowl for you and let it cool a little. Have a taste and see what you think…if you like you can add a squeeze of lemon juice, a little sugar or some black pepper. Adult’s job: spoon into bowls to serve. You can either sprinkle herbs on top or put them in a small bowl on the table for the kids to taste first. The soup is great served with chunky bread. Safety first! Use a knife which doesn’t have a pointy end. You can buy plastic “salad knives” for very little money which are ideal for kids to use, they can also use a scallop-edged "sandwich knife" (not a serrated one which cuts fingers easily). Kids may need help chopping hard vegetables. There are lots of things that can be ripped by hand or chopped with (clean, child-friendly) scissors, such as herbs, greens, spring onions and salad - they don’t really need to be chopped with a knife.